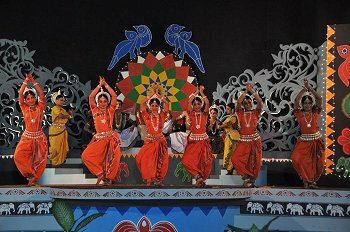 The initiative taken by Doordarshan, Bhubaneswar, in hosting an annual festival of Odissi dance, has had welcome success. Apart from adding to its classical programme content (the entire proceedings of this festival are recorded for future telecast), it also provides a good opportunity to a variety of dance groups and institutions to present their artistes without having to curry favour with the State Govt. authorities for State sponsored festivals. A good opportunity eagerly seized by the artistes for this year's Odissi Dance Mahotsav, as has been the case in the last few years of this festival. 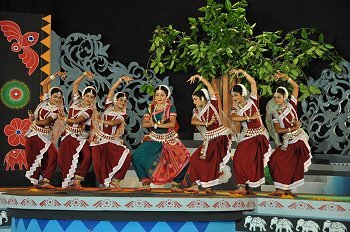 A total of 15 Odissi presentations in a five day festival is an impressive effort on the part of Doordarshan, and they need to be commended. There are however a few things that the hosts need to take note of, especially when inviting a wide range of performers with varying standards. The selection of artistes needs to be tightened somewhat, to do away with avoidable embarrassment: the pre-publicity for this event should have been more effective in drawing a substantially larger audience than the one which turned up for a festival that has involved so much effort and expense. Certainly, greater thought is needed while designing the stage, especially when it comes to a classical dance performance. In this particular case, Doordarshan used a feast of colours on the backdrop which ended up causing more than slight indigestion! The costumes of the artistes were overshadowed by the explosive richness of the coloured background. A little unfair to the dancers themselves, I thought. A similar problem was faced by the gentleman doing the compeering, Srinivas Ghatuary. He was asked to wear the classical Odissi costume, possibly with the idea of matching with the dancers themselves. His discomfort was palpable; the bare-chested elegance of the male dancer cannot always be shared by the Master of ceremonies! Ghatuary himself is a fine performer, and his normal eloquence could have done without the stress of being decked up as a dancer, bare chested and all. 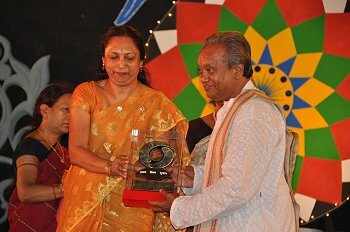 Doordarshan, Bhubaneswar used the opportunity to honour four senior artistes with mementos and testimonials. The recipients were Guru Gopikrushna Behera, Dr. Priyambada Mohanty Hejmadi, Guru Ramani Ranjan Jena and Guru Gangadhara Pradhan. However, the proceedings became long drawn out and monotonous because the lengthy biographical details of the recipients was presented (using video clippings as well as read-out materials) thus giving out the details not once, but twice!! 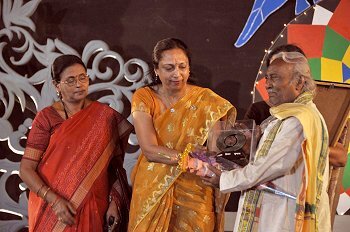 Honoring Guru Gopikrushna Behera in the category of Odissi dance was a trifle difficult to understand, since, he is primarily known as a theatre person who composed dances for Oriya "Jatra" (folk theatre)! 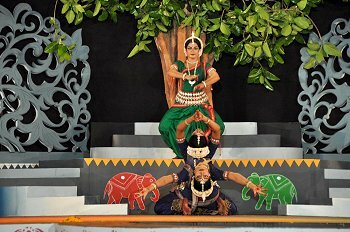 The opening item "Kumar Sambhavam" was presented by the dancers of Guru Kelucharan Mohapatra Odissi Research Centre. Choreographed by Guru Durga Charan Ranbir, it was set to music by Guru Ramahari Das. The movement design was not the best that we have come to expect from Guru Ranbir; the sequences were too long to be able to hold the attention of the viewer, thus creating at times, avoidable monotony. Hand synchronization of the dancers was surprisingly poor: surprising, because the dancers of GKCM Odissi Research Centre are supposed to have, as their primary focus, rigorous dance practice. The expected diligence was missing. Also, the pre-recorded sound of the ghungroo was at a different beat to the rhythm of the dancers' feet! A rather disturbing experience for anybody, especially for dancers themselves. While the dancer playing Lord Shiva (Munmun Chakrovarty) seemed to lack in vigour at times, the dancer playing Rati (Rojalini Srichandan) was very good. The next item "Krupa Nidhana" choreographed by Guru Aruna Mohanty, was set to music by the late Akshya Mohanty and Guru Bijay Kumar Jena. The choreograph was, in various ways, thought provoking. The balance of an otherwise good production was occasionally shaken by a few fumbles in the performance of the male dancers in the group. Aruna Mohanty herself is an excellent dancer and lip synched the words of the song ("Pashyati dishi dishi") she was dancing to. The emoting was of a high order, the dancer completely involved in the dance where she completely forgot herself and the surroundings. Truly moving experience. 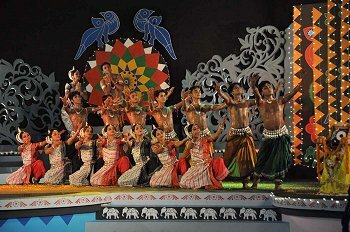 The opening item on the second day was "Buddha" choreographed by Guru Durga Charan Ranbir with music by Sukanta Kundu. The musical composition was very good, the tunes very pleasing, and the ambience created by the music totally befitting to the theme of the choreograph. An instance where the accompaniment lifts the choreography to another level. Although the dramatic movement was on the slower side, the choreography gave ample opportunities to the dancers to mix aesthetically, a high level of miming with movement. Especially noteworthy was the performance of Leena Das in the role of the swan, and the performance of Shankar who played the role of the suffering leper. 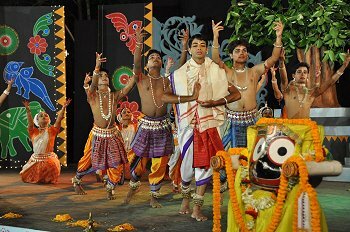 It was nice to see artistes like Rahul Acharya and Debashis Pattnaik delivering, yet again, commendable performances. 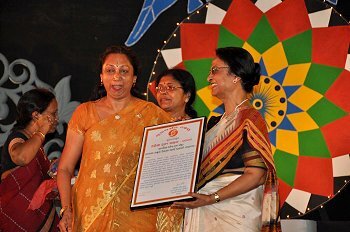 The following item was titled "Mu Konarka Kahuchi" and was presented by senior artiste Meera Das and her group Gunjan Dance Academy. What followed had very little to do with the soul-stirring story surrounding the 12th century monument, the Konark temple. In a flight of incomprehensible imagination, the national song "Vande Mataram" was dragged into the composition and little while later the familiar Oriya patriotic song "Vande Utkala Janani" was also harnessed for god knows what purpose. The composition, already disturbed by these irrelevant songs, was further troubled by Meera Das popping in and out of the stage in the role of a Sutradhara and then suddenly reappearing as one of the dancers at the end. The language used by the Sutradhara bordered on the tasteless and succeeded in diluting the gravity of a theme having Konark as its subject. If the choreography befuddled the audience, the performance of the dancers further aggravated their agony. On entry, (of the Pallavi "tarijham tarijham taritakajhenu taritajhenam") the dancers banged into each other; their overall performance showed unacceptable degree of weakness and lack of confidence, specially when a few dancers kept looking at each other as if to take a cue. The music composition also failed to live up to the mark; the shrillness of the female voice was particularly unpleasant and helped in further bringing down the level of the production. Considering Meera Das's international reputation, this was a shockingly inept presentation. The third and concluding item of the evening titled "Ritu Basanta" was presented by Guru Niranjan Rout who surpassed his known abilities as a choreographer. Both the dance composition and the music were good. The energy and vitality of the dancers showed in their obvious enjoyment in performing this beautiful story of Radha and Krishna. It was clear that a lot of preparation had gone into this presentation and a few minor lapses did not take away from the total efficiency of the production. Some attention however needs to be paid to the dancer who played the role of Krishna. While he certainly put in a lot of effort, since he is on the tall and lanky side, he gave an impression of a slight hunch while bending forward. This could have been avoided since Lord Krishna's figure is known to be well formed and of graceful proportions. That apart, Guru Niranjan Rout and his group can look forward to many successes if they continue with the same intensity of effort that was visible in this production. This reviewer could not be present for the 3rd (10th March) and 4th (11th March) evenings' performances which were presented by the following:- Guru Gajendra Panada and group performed "Sri Rama Charita": Guru Pitamber Biswal and group performed "Dhara Sri Radha": Rita Guru and Meera Bai Kala Vikas Kendra performed "Dadhyata Bhakti": Guru Ashis Das and Nrutya Mandal performed "Sri Radha Darshana": Nityananda Das and Kalashrama performed "Guru Dakshina": Sushanta Das and group performed "Kanyadana": Guru Kanduri Charana Behera and group performed "Bhashma Bhashmasura." The opening item on 5th and the final day of the festival was "Bhaja Govindam" performed by this reviewer Ratikant Mohapatra and his disciples of Srjan. The following item "Laba Kusha Bheta" was performed by Guru Kishore Mohanty's group. The music was composed by Akhila Kumar Lenka. The dancers arrived on stage decked up in the colourful costumes of the rural folk theatre (Jatra/Geeti-natya) of a bygone era. This attempt at innovation in substituting the Odissi costume with a folk theatre get-up, did nothing to enhance this Odissi performance. The group seemed to be a mix of Odissi dancers and theatre artistes, the latter not being very comfortable with the intricate work that classical Odissi demands. And what could have been a passable performance was diminished by the abandonment of the classical Odissi costume. Guru Kishore Mohanty is one of the seniormost dancers and teachers of the present times with decades of experience behind him. Hence a production by him needed to be more thought-out and more firmly grounded in the principles of neo classical Odissi. The concluding item of the festival was a presentation of "Geeta Gobinda" by Guru Naba Mishra and group. By and large a neat performance, with Naba Mishra standing out as a capable and graceful dancer. There were, however, a couple of instances where the choreography could have been tightened up. There were two female dancers on stage both looking like Radha and this led to some confusion in the audience. In the "Yahi Madhava yahi Keshava" sequence, Radha exhorts Krishna to go away and stop lying to her. This was a moment of agony for Radha and could have been choreographed as a private and distressful conversation between Radha and Krishna. The role of two Sakhis (Radha's companions) being privy to Radha's private laments in the early hours of dawn, was difficult to understand. What exactly, then, were the Sakhis doing there?? On the plus side, the execution of "Chandana charchita" sequence was very good and pleasing. In the "Rase Harimiha bihita bilasam" sequence, the design of movements was attractively done; Guru Naba Mishra's composition for this song appeared to have infused freshness into the item. 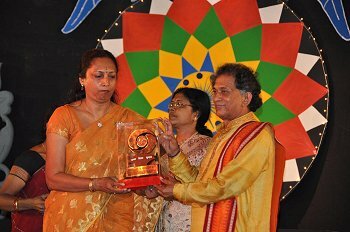 The festival had been inaugurated by Deepa Chandra, Dy. Director General (Eastern), Doordarshan Directorate General, Delhi. Also present on stage were Jayant Manjari Rath, Executive Producer and Lalit Keshari Pradhan, DDK Chief and Superintending Engineer of Doordarshan, Bhubaneswar. The opening day of the festival coincided with the International Women's Day. This was a thoughtful gesture on the part of Doordarshan, Bhubaneswar.